I forget sometimes how satisfying it sometimes feels to write in the afternoon. The holes I left in the A.M. get so readily filled in the P.M. What seemed so unclear in the dark of the A.M. shines lucidly in the P.M. But the P.M. wouldn’t occur with out the work of the A.M., and so I arise early, make the coffee and sit in the semi-dark surrounded by the books and folders knowing all will soon make sense. Here is this passage from Adam Bede that appeals to me. “For there is no hour that has not its births of gladness and despair, no morning brightness that does not bring new sickness to desolation as well as new forces to genius and love. 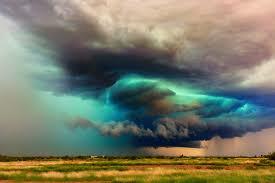 There are so many of us, and our lots are so different, what wonder that Nature’s mood is often in harsh contrast with the great crisis of our lives? We are a children of a great family, and must learn, as such children do, not to expect that our hurts will be made much of¾to be content with little nurture and caressing, and help each other the more.” It surprises me how prescient George Eliot seems to be here, speaking in the language of many of our contemporary ethicists and cosmopolitans. The world does not move to our rhythms, does not care about our desires, wishes or intents. Our lives are filled with contradictions that must be borne, no, that must be simply accepted, even as our powerlessness to control very much has to be acknowledged and lived. What Eliot suggests is that for the most part our hurts and complaints will fall on ears oblivious of our plaints. Nevertheless, and almost contradictorily, Eliot urges in the midst of this silence and apathy that we must be prepared to offer sympathy and support—though I prefer the concept of ‘nurture,’ the term Eliot employs. And I suppose that what she means by this is that we must address not the particular injury but respond to the inevitable susceptibility to injury, to disappointment and despair to which we are all subject. I suppose this is the message of Ecclesiastes: to everything there is a season. Everything is here always; everyone is here always and we are all not the same. No wonder everything happens! And so the question “Why me?” is absurd, because if not me then it must be someone else, but eventually it¾whatever it may be¾ comes back to me. Opposed to Thoreau’s optimism that the sun is only a morning star, Eliot suggests that the morning star sometimes might bring darkness. I am back in company with George Eliot. Years ago—I can’t recall how many—I participated in an NEH seminar in the English Serial Novel: Dickens, Eliot and James. The seminar was held at Longwood College in Farmville, Virginia, which aside from being the residence of what is now Longwood University, also holds renown for being the last town through which Lee marched on his way to Appomattox. During that summer we read and discussed some Dickens (Nicholas Nickleby, I think it was), Eliot’s Middlemarch and Daniel Deronda, and James The Princess Cassamasima. But the whole day was left free after the two-hour seminar in the morning and I read a great deal of George Eliot, and I have now 30 or 40 years later set a goal to reread her. 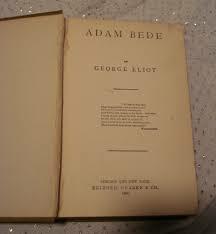 And I have started with her second novel (1859), Adam Bede. Its epigraph comes from Wordsworth who seems of late to have entered my life with some force, and especially with two of his poems, the “Intimations Ode” and “Tintern Abbey.” Eliot draws her epigraph from the section of the The Excursion, Book VI, “The Churchyard-Among the Mountains” which reads (in part) “and when/I speak of such among the flock as swerved/Or fell, those only shall be singled out/Upon whose lapse, or error, something more/Than brotherly forgiveness may attend.” I think these lines speak to the book’s subject: characters flawed in very human ways whose tragic fates require more than mere ‘brotherly’ love. And what is greater that brotherly love, I wonder? 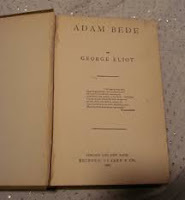 There is a set of brothers in the novel: Adam and Seth Bede, and I am not far enough into the book nor do I remember the fates of these siblings from my prior reading to know to what extent the epigraph refers to them. But in general Eliot seems suspicious of family relations: the epigraph addresses a love that surpasses filial regard, a love that exceeds the normal love of family. The narrator admits, “Family likeness has often a deep sadness in it. Nature, that great tragic dramatist knits us together by bone and muscle, and divides us by the subtler web of our brains; blends yearning and repulsion; and ties us by our heart-strings to the beings that jar us at every movement.” I think that we can be hurt by many but struggle most and always with family. They are our first, our formative and lasting relation to others, and these relations are filled with contradiction. We become our families despite our intent: “We hear a voice with the very cadence of our own uttering the thoughts we despise; we see eyes—ah so like our mother’s!—averted from us in cold alienation; and our last darling child startles us with the air and gestures of the sister we parted from in bitterness long years ago.” We are condemned to repeat and to recreate our families despite our intent, and as son and father I am startle, disturbed and knowing complicit in the thought. Perhaps there is no greater joy and no greater sadness than that which derives from family relations because no matter how much we struggle and revolt, there is no escape from them.